Hey Sandy, I made these cards for you. Sandy had emailed me because she had bought a few of the Fiskar Clear Stamps that I had done a product review a few weeks ago and she wanted samples of cards that could be created with the stamp sets. 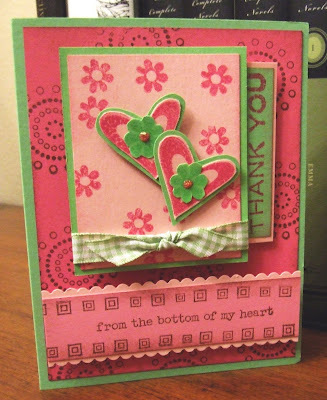 I made two cards using the Fiskar "Thank You" clear stamp set. The stamp set is very versatile and it has a lot of stamps to work with. Not much commentary to this post because I need to get ready for dinner. I just wanted to post the cards so I can email Sandy and let her know that I made a few cards so she can take a look at the sketches I did and hopefully, give her a few ideas on what designs she can do with the stamp set. 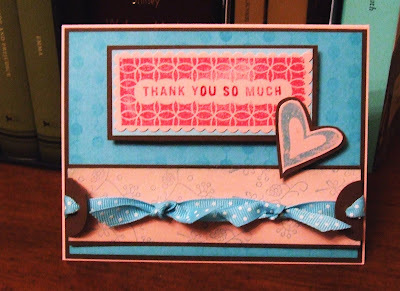 Great cards Maria...love those sketches and color combos!